Lucky Ducts Video Slot Review - Casino Answers! Lucky Ducts is a 5-reel, 19-line video slot developed by Slotland Entertainment, featuring scatter wins, a free spins feature and a progressive jackpot. You can play the Lucky Ducts video slot at Slotland Casino. Bets on the Lucky Ducts slot machine are $0.25, $0.50, $1, $2 and $4 per line. You can select up to 19 paylines per spin on the Lucky Ducts video slot. Lucky Ducts is a quarter slot, so the minimum bet is a quarter per spin. The maximum total bet is $76 per spin. The Lucky Ducts casino game has a decent betting range that should suit most online casino players. 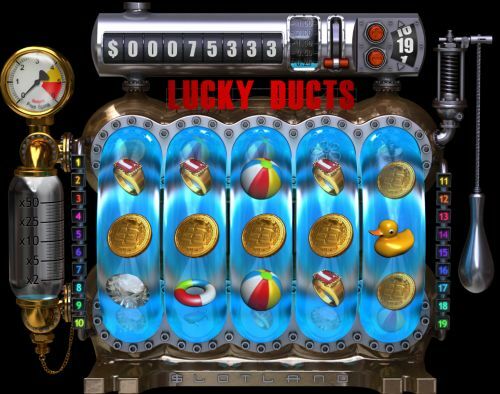 To play the Lucky Ducts video slot, select your bet and pull the handle at the right. Lucky Ducts is linked to the Slotland Progressive Jackpot. At the time of this writing, this progressive jackpot is at $75,390. To win the progressive jackpot on the Lucky Ducts video slot, you have to land 5 Diamond symbols on a selected payline while making a total bet of at least $20. You can attempt to win the Lucky Ducts Progressive Jackpot by playing at Slotland Casino! At the left of the reels, you will see the Bonus Reservoir. The Bonus Reservoir has 5 levels – X2, X5, X10, X25 and X50. These represent scatter wins. You will be paid out a scatter win depending on how much water is in the Bonus Reservoir. 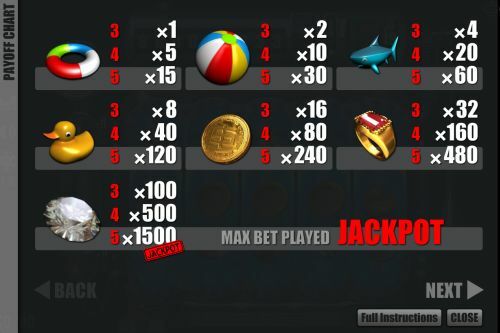 By landing 3 Scattered Faucet symbols anywhere on the screen, you will increase the Bonus Reservoir. To win the Bonus Reservoir and receive your scatter win, you must have 3 Scattered Plug symbols appear anywhere on the reels. If the Bonus Reservoir is at its highest level of X50 and you land 3 or more Faucet symbols, the Bonus Reservoir will overflow and you will win 6 free spins as displayed on the gauge above the Bonus Reservoir. The Bonus Reservoir will be reset to zero. The Lucky Ducts video slot has a theme that we haven’t seen anywhere else on all of the hundreds or even thousands of video slots around. The slot game itself has a couple of interesting special features that definitely keep things interesting. It also has a progressive jackpot that adds a very special element to playing a video slot. You can play the Lucky Ducts video slot by signing up and making a deposit today at Slotland Casino! How do I win the Lucky Ducts progressive jackpot? To win the Slotland Progressive Jackpot on the Lucky Ducts video slot, you must first be making a total bet of $20 or more. Then you must land 5 Diamond symbols on a selected payline to trigger the progressive jackpot. Can USA players play the Lucky Ducts slot game for real money? Yes, American players are allowed to play the Lucky Ducts video slot for real money at Slotland Casino. Can I play the Lucky Ducts online slot for free? No, you must make a deposit to play the Lucky Ducts video slot. Free or practice play is not available at this time at Slotland Casino. Do I need to download any software to play the Lucky Ducts slot game? No, there is no casino software to download to play the Lucky Ducts slot machine. If you experience any difficulties with the flash casino, make sure you have the newest version of Adobe Flash Player installed on your computer for the best possible performance. ﻿In 2010, Betfair announced it had passed the three million customers mark. In 2004, Martin de Knijff won the second WPT Championship.